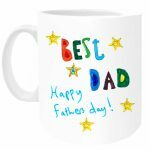 To raise funds for your school, why not create individual full colour Father’s Day mugs for your school, nursery or playgroup! For each child we provide a mug template for them to create their own unique and colourful design. Bold felt tip pens and paint give great results. The template also includes an order form section for parents to complete. This means that they can view their child’s design and note their order, all on one sheet, to make the process simple. Once all the templates have been completed, the organiser returns them to us and we prepare the order. We also individually box the mugs, ready to hand out. It normally takes approx. 2-3 weeks from receipt of your designs to process and deliver your mug order. Mugs are just £4.15 each (inc. VAT) to the school and have a recommended price of £6 to parents. If you’d like to take part in this project, you can order your kit online. We include instructions with all of our kits, but our team are here to help if you have any questions or would like more information about creating your designs. Please note that for all orders under 25 mugs there is a £7 ex VAT delivery charge.